Configure email alert in any website or tools like Tradingview, coindera.com, cryptalert.com, cryptoping.tech, etc. 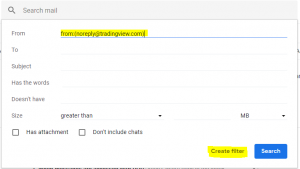 Lets start with Tradingview email alerts to demonstrate a use case. In this example we will create an alert in tradingview and set a forwarding rule in Gmail Inbox to forward tradingview emails to trailingcrypto which in turn will automatically execute a pre-configured order. Auto Detect – Automatically Detects coin from the received alert email. If disabled email must contain coin pair mentioned in the Order parameters. Contains – Comma Separated List of Strings that must be there in the email for the order to get executed. Not contains – Comma Separated List of Strings that must not be there in the email. Enter the amount that you wish to buy and submit the order. Enable Demo mode if you wish to do testing. Review or Cancel existing orders from Trigger Tab in order history table. click on the refresh icon to update the table data. Could you please provide a few examples of email content, to help to create email than will be easyly interpreted by trailingcrypto ?